The perfect solution to rebuild your old DVD collection with original quality or backup new DVD data/content before it gets damaged. Built with 9 DVD copy modes, it can meet all your DVD backup demands. ● Clone DVD to DVD, ISO image, VIDEO_TS folder. ● Copy main title to DVD, or DVD to a single MPEG file. ● Mount ISO image, burn ISO or DVD folder to DVD. ● Extract video audio only. Support Disney's fake. ● Restore Sony ARccOS bad sectors/corrupted sector. Ditch iTunes & manage iPhone freely. Sync any media files without data loss. Remove DRM of iTunes purchases. Create ringtone; Turn iDevice to USB. WinX DVD Copy Pro is perfect for backing up your discs, even if they’ve accumulated scratches that might make it impossible to use them in a regular DVD player. Like other Digiarty products I've used (most notably the company's WinX DVD Ripper Platinum), WinX DVD Copy Pro works quickly and efficiently. It's a nice tool to have in your arsenal--assuming you're even using physical media any more. 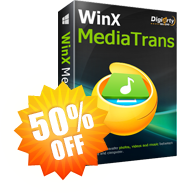 WinX DVD Copy Pro is an application that allows you to create copies of your DVD videos, in case they are damaged or lost.